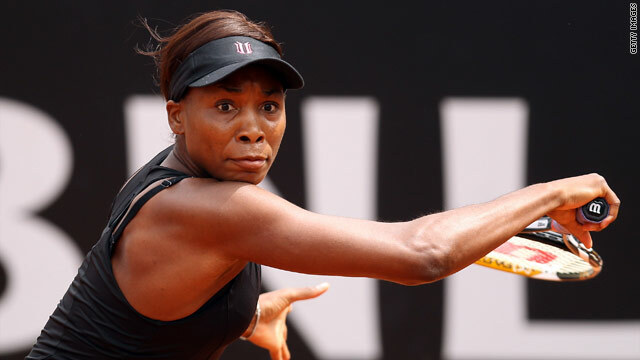 (CNN) -- Venus Williams brushed aside the challenge of Patty Schnyder to book her place in the third round of the Italian Open in Rome on her return to action. The world number four dispatched the challenge of Schnyder, from Switzerland, 6-2 6-2 in just one hour and 14 minutes after nearly a month out due to a knee injury. Williams will now play Shahar Peer in round three after the Israeli recovered from dropping the opening set to beat Polona Hercog 2-6 7-5 6-3. Fourth seed Williams breezed through the opening set in just 37 minutes after losing her first service game, and showed no signs of rustiness after her lay-off. She again dropped her opening service game in the second set but completed six breaks of the Schnyder serve to record her victory. World number one Serena Williams also overcame Swiss opposition to join her sister in round three after a 7-6 6-1 win over Timea Bacsinszky. Serbia's Jelena Jankovic won through to round three after a 6-3 3-6 6-1 win over American Bethanie Mattek-Sands. But former world number one Dinara Safina's poor form continued as she was dumped out of the competition by Romanian Alexandra Dulgheru, losing 6-4 6-7 6-1.